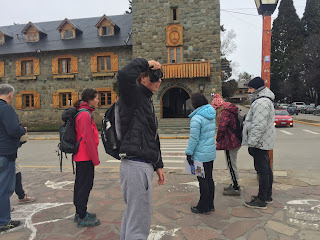 Aulas de espanhol em Bariloche. Aprenda espanhol e viva la patagonia!!! 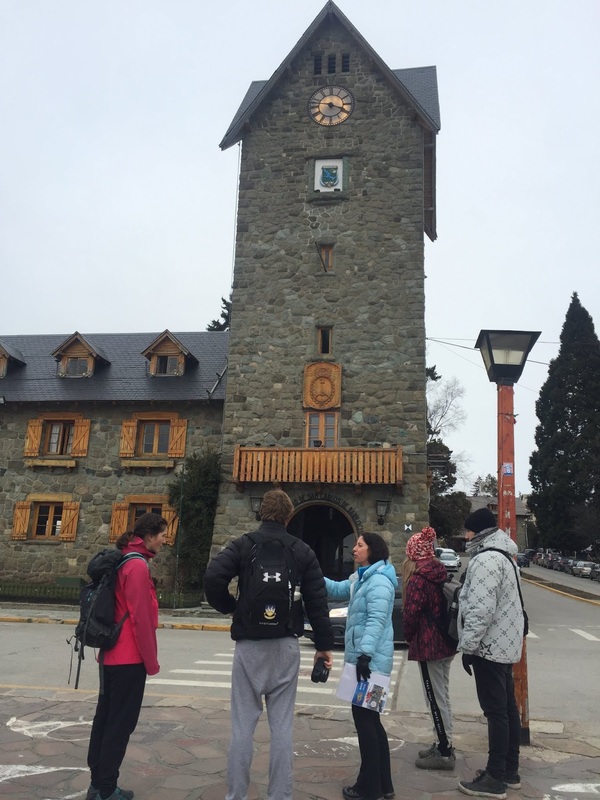 As part of our Cultural Activities, we visit some historic sites in Bariloche. One of these takes place in the most important cultural area: Centro Civico surrounded by Town Hall (and clock tower), Main Police Station, Patagonian Museum, Public Library, Sarmiento theater and an Art Gallerie. 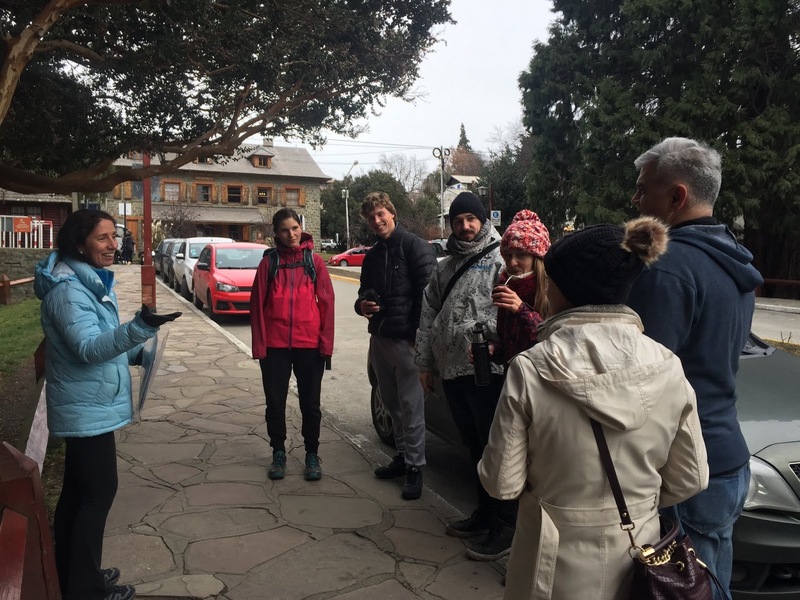 Led by a local licenced guide, we stroll around the area learning about the history of Patagonia and Bariloche, after which we enjoy a delicious coffee or hot chocolate. Great mix of academic review and hands on projects kids can share. Lesson cadence well designed; where kids can take a break between sessions. The entire school will celebrate the kids´work each Friday. 1- Can a Spanish Language school give us support during the critical first month of a family trip? 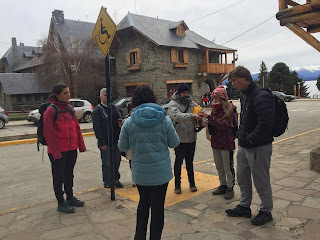 Yes, La Montaña has a vast experience in supporting families travelling through South America who have decided to start their trip in Patagonia. b. Learn about the history of the host countries, indigenous cultures, rural tourism, environmental projects among others. c. Spend more time together, as a family. d. In some cases, experiment with unschooling. 3- What is the best place to spend the first part of the trip? Bariloche is certainly a very good choice and you can trust La Montaña as a partner on the language instruction. You can read more about Bariloche and hints about why is it good for families using this link about Bariloche. 4- Why La Montaña for my family? La Montaña is able to meet a wide range of Spanish learning needs of a family, even if the family don´t really know how to diagnose well on their own. La Montaña will help the kids feel at home after a big disruption in their day to day routine. La Montaña will make this work in a schedule that still give the family time to explore the outdoors and get started on research according to their own interests. La Montaña can serve kids and adult learners. La Montaña is a strong team, a strong school, and a gorgeous location to study the Spanish language. 5- What will La Montaña do for us? After conversations about your unique needs we will start a diagnosis of your pre-screening surveys, so you can make the big decision of the trip and book classes at La Montaña as a starting point for your trip. It will be the right call, for sure. Our team will craft a custom schedule for each member of the family before your arrival, making special plans for the kids, tweaking plans for each of member, tuning homework, and keeping parents updated on what is next. La Montaña will become your home away from home, and we will take care that everyone on the team take responding not just to the family, but to an incredibly wide range of learners from all over the world that will be in the school at the same time. Teachers at La Montaña will investments time each week building school-wide culture; the offsite excursions and happy hour events will be a great way to meet folks that you will remain in touch with thereafter. La Montaña team will take care of your family while giving a deep foundation in Spanish language that will give you and your family the language confidence to transform you from disconnected tourists into fluent and humble travelers. These FAQs have been written upon feedbacks received from former students of La Montaña Spanish School in Bariloche, Patagonia.